HELENA — University of Jamestown (North Dakota) women's wrestler Alyssa Schrull is on a roll. After going 10-1 over the past three weekends, which included an eight-match win streak, the junior Jimmie’s 170-pounder has moved up to No. 7 in the national NAIA rankings. Two weeks ago, Schrull, a Helena High product, captured the championship at the Ez-Flex Invite in Ottawa, Kansas. She went 5-0 in the tournament, pinning three opponents and posting shutouts of 8-0 and 5-0 in the other two bouts. Last weekend, she was 5-1 at the York (Nebraska) College Duals Open, with two staples, two technical falls (12-0, 10-0) and a 5-0 whitewash. Her lone setback was a narrow 7-6 loss to Marissa Patterson of York College, who dropped down from the 191-pound class. The Jimmies went undefeated in the duals, and are currently rated No. 3 in the nation. Schrull, who wrestled all four prep years for the Bengals, had garnered three USAW state titles and nine all-American citations in various divisions during her youth career. She then became the first Capital City girl to receive a college wrestling scholarship. As a Jamestown sophomore grappler last year, she earned the Kansas Collegiate Athletic Conference Invitational title at 170 pounds, while receiving the all-KCAC Champions of Character medallion. She then tied for ninth place at the 2018 Women's College Wrestling Association National Tournament in Oklahoma City. This season, prior to the last three weeks, Schrull placed runner-up at the Waldorf Open in Forest City, Iowa, to teammate Myranda Velasquez. 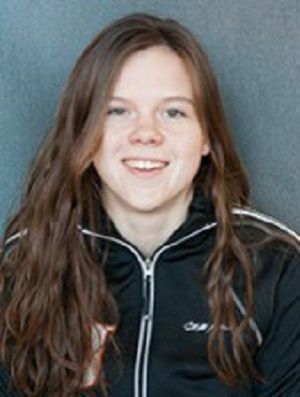 At the Missouri Valley Open, she produced three victories for the Jimmies. At Great Falls’ Battle of the Rockies, she placed fifth, posting a 10-0 major decision over the University of Providence’s Anastasia Hardin in the fifth-place match. In the weight room, her workouts consist mainly of pullups and squat lifts. The daughter of E.J. and Jamie Schrull, Alyssa is majoring in biology at UJ. Next up for Schrull, who stands at 16-6 on the year, are the WCWA Nationals in Atlanta on Feb. 8-9 and the KCAC Championships in Marshall, Missouri, on Feb. 23. Then the season culminates with the inaugural NAIA National Women's Wrestling Championships on March 15-16, hosted by Jamestown in the Harold Newman Arena. Curt Synness can be reached at curt52synness@gmail.com or 594-2878. He’s also on Twitter @curtsynness_IR. University of Jamestown (North Dakota) womens wrestler Alyssa Schrull is on a roll. After going 10-1 over the past three weekends – which included an eight match win streak – the junior Jimmie’s 170-pounder has moved up to No. 7 in the national NAIA rankings. Last weekend, she was 5-1 at the York (Nebraska) College Duals Open, with two staples, two technical falls (12-0, 10-0) and a 5-0 whitewash. Her lone setback was a narrow 7-6 loss to Marissa Patterson of York College, who dropped down from the 191 class. As a Jamestown sophomore grappler last year, she earned the Kansas Collegiate Athletic Conference Invitational title at 170, while receiving the all-KCAC Champions of Character medallion. She then tied for ninth place at the 2018 Womens College Wrestling Association National Tournament in Oklahoma City. In the weight room, her workouts consist mainly of pull-ups and squat lifts. The daughter of E.J. and Jamie Schrull, Alyssa is majoring in biology at UJ. Next up for Schrull, who stands at 16-6 on the year, are the WCWA Nationals in Atlanta on February 8-9, and the KCAC Championships in Marshall, Missouri, on February 23. Then the season culminates with the inaugural NAIA National Womens Wrestling Championships on March 15-16, hosted by Jamestown in the Harold Newman Arena.